The Iranian Nuclear Crisis has always interested me. I have written an article about it before on here, and will write more in the future. Unthinkable by Kenneth Pollack discusses that topic, and talks about our strategy toward facing it. Unthinkable begins with a short history of modern Iran. It describes Iran, why it wants a nuclear bomb, and the reason why it is so fanatical about it. Pollack talks about the Shah, the West’s involvement with his government, and then how our relations splintered when the Iranian Revolution occurred and American hostages were taken. The book then delves into our possible solutions to prevent Iran from getting “the bomb”. It discusses the pros and cons of diplomacy, regime change, Israeli air strikes, and proliferation. It accurately gives each solution in a good and bad light, and gives all the possible ramifications of each. Finally, it ends with the 2 options if we do nothing now: Containment or War. It talks about how, if it gets to the point when Iran gets a nuclear bomb(s), we only have these 2 choices, and how we have to pick the lesser of the evils. Pollack says that containment keeps us out of conflict, but costs a great deal of money, and may upset other Arab nations, such as Saudi Arabia and the UAE. He also says that, while war would end an oppressive regime quickly without nuclear conflict, it is proven, by our war in Iraq, that it would cost American lives and money and may not accomplish its goal. He argues that we need to end the Iranian Nuclear Program through diplomacy NOW, before we have to pick one of these options. One of the best nonfictions I have read in a long time, Unthinkable by Kenneth Pollack opened my eyes to many new things regarding the Iranian Nuclear Program. Written from an unbiased place, it analyses all options fairly and allows the reader to pick which option would weigh best on their consciences and pocketbook. Kenneth M. Pollack is an expert on Middle Eastern political-military affairs, with particular emphasis on Iraq, Iran, Saudi Arabia and the other nations of the Persian Gulf region. He is currently a senior fellow in the Saban Center for Middle East Policy at the Brookings Institution. He served as the director of the Saban Center from 2009 to 2012, and its director of research from 2002 to 2009. Last year, 2013, produced a very important movie: 12 Years A Slave. I have to admit, even as someone who loves to read history, especially from this time period (1600-Present), I had never heard anything about Solomon Northup or of his memoir, and many others hadn’t either. When I began to do research into 12 Years A Slave when the movie came out in the theater, I found a story of a man born free but tricked into working as a slave in Louisiana for 12 years and I decided to read the book, and Penguin kindly provided me with a review copy, along with another book that I will be reviewing in a few days when it comes out. Solomon Northup was born in New York in 1808, a free man. He was a musician, a reputable fiddling who played at local dances often. In 1841, he is offered a job to play as a fiddler in New York City in circus performances for a short time. After this, he is persuaded to go to Washington DC to play, and is drugged and sold to a slave trader. As Solomon proclaimed his freedom, however, he was beat savagely by his captors and sent on a ship to New Orleans. Northup, renamed Platt, was sold to William Ford, who Northup described in the memoir as there never being a more “kind, noble, candid, Christian man than William Ford.” Later, Solomon was sold to a man named John Tibeats, who was a cruel, savage man, once whipping Northup because he didn’t like the nails he was using but wanted no other kind, and when Solomon fought back and proclaimed that he was a free man, he was within seconds of being lynched but was saved by Ford’s overseerer. Another time, later, Tibeats tried to kill Solomon with an axe, but Northup dodged and strangled Tibeats with his hands to the point of unconsciousness. Solomon, after 5 weeks of being owned by Tibeats, was sold to Edwin Epps. Another cruel master, Epps whipped the slaves that did not meet their daily quota and sexually abused one of the slaves named Patsey. In 1852, Northup met an abolitionist named Samuel Bass who mailed letters for Solomon and the letters eventually reached his father’s former master’s son, who went down to Louisiana and proved that Northup was a free man. This was accepted, and Solomon Northup was free again after 12 years of slavery. He later pursued charges against his captors, but was unsuccessful, and is believed to have died in 1863. The director of the 2013 movie 12 Years A Slave, Steve McQueen, said that he “could not believe that I had never heard of this book. It felt as important as Anne Frank’s diary.” I couldn’t agree more. A firsthand account, Northup had the unique viewpoint of being both a free man and a slave, and someone who was educated enough to write such an articulate recollection, challenged only by Frederick Douglass. I hope all will go see 12 Years A Slave in the theaters now, or when it come out on DVD, and read the actual memoir from Penguin Classics. NASA wants you to put your name on one of their space probes. No, I’m serious. NASA and The Planetary Society are partnering together to conduct the “Messages To Bennu” program. Announced on January 15th, 2014, the public can submit their names by September 30th to appear twice on the OSIRIS-REx probe, planned for launch in 2016. The probe will travel to the asteroid 101955 Bennu, and will collect a sample of the asteroid and a part of it will bring this sample back to Earth. The main craft, which, after the sample collection will enter solar orbit, will have one of the microchips with the names on it. The other microchip will be on the collection craft, and will be back to Earth around 2023. So, your names will go to space, and if other NASA “Name To Space” programs have anything to say about it, the chip on the return probe may end up in a museum! To send your name to space and back, go to The Planetary Society’s Messages To Bennu Page. I sent my name in and it will be on the space probe, and I hope you will too! On Tuesday, January 28th, President Obama will be giving the 2014 State of The Union Address. With an ambitious 6th year in office ahead, President Obama will be eager to get as much done as he can. Currently the President has an average of a 29% higher approval rating over Congressional Republicans, and he needs to use that, grow it, and pursue these 5, but not limited to, initiatives this year and lay them out on the 28th. Last year, the Supreme Court struck down Section 4 of the Voting Rights Act. This lead to currently 35 states pursuing Voter-ID laws, a requirement that requires you to present your ID at the time of voting. I know it sounds simple, but it is far from so. The biggest state to implement this law so far is Texas, and, according to the Justice Department, they have between 600,000 and 795,000 citizens that do not have IDs and do not have the money or time to acquire them. If Voter-ID is implemented in the 35 states currently pursuing it, over 23 Million Citizens may not have the ability to vote. We already have issues getting people out and able to vote. Do we really need to make it harder? These laws disproportionally affect the poor and minorities, and I call on the President to make Voting Rights a major part of 2014 and that he helps Attorney General Holder and other officials in the Justice Department to pressure and prosecute states that have Voter-ID on their books. The President has been pushing for both of these programs for a long time, and I would like him to use the bully pulpit to pressure Congress to pass them. I would like to see a Pre-K program where we use the power of the Internet to connect classrooms, and help teach culture from an early age. Can you imagine the cultural benefits of using online translators to have little children from Detroit talk to little children in Seoul? Imagine all the possibilities! I also would like to see the Fed. partner with colleges to train 2 million teachers in 10 years. This training should prepare aspiring teachers to be able to teach their future classes to be able to compete with the world to keep the US as the makers and innovators. The Senate passed the bipartisan immigration reform bill last year overwhelmingly. I hope the President uses the moral argument to put pressure on the House to pass this by the end of the year. We need to make a leap forward on immigration, as it will strengthen our national security, make us a moral nation, and will significantly grow our GDP. Last year, the President and the EPA put historic caps on pollution. I would like to see a reduction in our oil and coal reliance in half in 10 years, even if that means using natural gas as a transition. I would like to see natural gas, solar, wind, nuclear, and hydroelectric power be invested in and take over as our primary source and then our sources of energy. Hopefully, in 25 years, we will be off coal, oil, and other fossil fuels for good. I would also like to see the President’s other proposals put into action, like preparing us for stronger storms and weather, and to train more workers for Green Jobs. For the last few years, Senator Kirsten Gillibrand has been advocating for her bill to change the way sexual assault victims in the military prosecute their perpetrators. Earlier this week, the President gave a speech where he told sexual assault victims that he has their back. I would like him to call on Congress to pass Gillibrand’s bill, as it would be a huge step forward. I look forward to this year’s State Of The Union Address and I hope you tune in! “The Loyalist’s Wife” is set during the War for Independence, but with a unique viewpoint, the Loyalists. Most writers that write about this era shy away from this viewpoint, but not Elaine Cougler. “The Loyalist’s Wife” follows the pioneers John and Lucy Garner, who have settled in Upstate New York. John is called to duty as a British soldier, and has to leave Lucy to run the homestead herself. But with the heavy physical and emotional labor, a baby on the way, and strange visitors, can she really handle it all? And John, who is fighting as a Butler’s Ranger, will have to survive numerous times when accidentally left behind. As both lose hope that each other are alive, we see their paths cross and then move away from each other, always seeming to be so close, but too far. Can the Garners be reunited, or will this war, as it has so many others, tear them apart? This book was excellent. I enjoyed the unique viewpoint put forward by this book. This story documents well the hardships of war and homestead in the Colonies, and the heartbreak, grief, and guilt. It captures an era as if the author lived the events. “The Loyalist’s Wife” also includes a character who is a major part of my family’s heritage, Joseph Brant, who will be a major character in the conclusion of my own trilogy (See My Spectemur Agendo Trilogy.) Overall, this book is a whole new look at arguably the most important time in human history, shows how the revolution of one nation helped set the groundwork for another, and accurately displays the human cost of war. 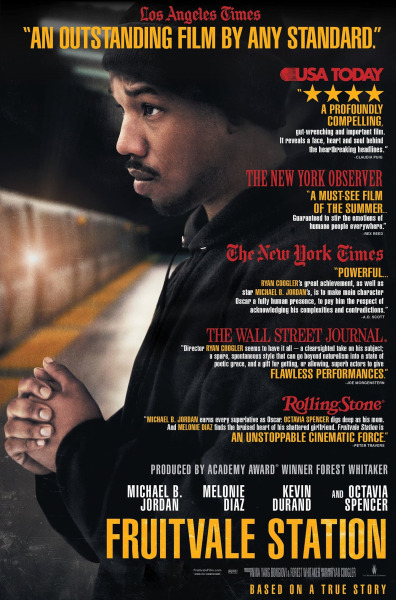 This review is for “Fruitvale Station”, directed by Ryan Coogler and starring Michael B. Jordan, Melonie Diaz, and Octavia Spencer. This movie came out on DVD in the United States on January 14, 2014. “Fruitvale” tells the true story of Oscar Grant III (played by Michael B. Jordan), who is fatally shot by Bay Area Rapid Transit (BART) Officers in the early morning hours of New Year’s Day 2009. This biopic shows a day of Oscar Grant’s life, New Year’s Eve 2008, where he pledges to be a better man, to love his daughter better, and other resolutions. Grant is trying to escape his past, to fix it, before it hurts anyone else. We see Oscar in all aspects in this film, from compassion to a hardened shell, only as a film focusing on 24 hours could. We see him trying to love his daughter even though trying to keep her naive from what is going on around her. New Year’s Eve is Oscar’s mother’s (played by Octavia Spencer/The Help) birthday. Shown well is Oscar and his mother’s bond, one broken and forged over and over again. Oscar is shown then going to New Year’s celebrations with his friends and girlfriend, and something from his past comes back to hurt him. He is caught up in a fight, and for simply trying to prove his innocence, has racial epithets thrown at him. One thing leads to another and Oscar Grant is shot dead in the Fruitvale Train Station, just like in real events. This movie made me cry more than any other movie in a long time. As someone who fights for civil rights and racial equality, this movie really affected me and will affect anyone. It sensitizes you, in direct opposition to the normal desensitization, due to the emotional bond that you develop with Oscar. I truly believe that this movie should be seen by as many people as possible, to show that racial profiling did not end in the 1960’s. An event similar to Trayvon Martin’s and, almost 60 years ago, Emmett Till’s, deaths due to race, shown in a movie that puts a life with a name on a death certificate. I truly believe that this movie will change millions of hearts and will inspire many to take up the torch in our generation to end racial profiling and social inequality in America. -Appeared on numerous critics Top Movies of The Year Lists, such as critics with the LA Times, Washington Post, and others.